Kellogg Community College will bring classic holiday music to the region for a special “Sounds of the Season” concert in Coldwater and “Messiah” performances in Battle Creek and Monroe in December. 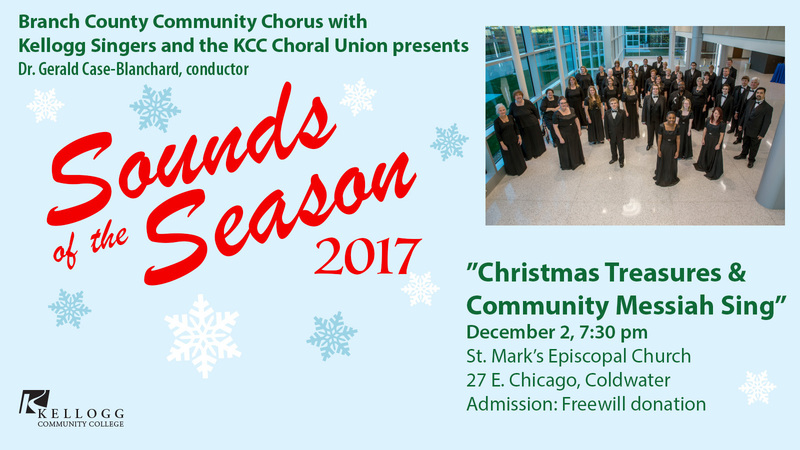 KCC’s “Sounds of the Season 2017: Christmas Treasures & Community Messiah Sing” will begin at 7:30 p.m. Saturday, Dec. 2, at St. Mark’s Episcopal Church, 27 E. Chicago St., Coldwater. The event is free and open to the public, though a freewill offering to support KCC music initiatives, including a 2018 Midwest Choir Tour, will be collected during the event. Under the artistic direction of Dr. Gerald J. Case-Blanchard, professor of vocal music at KCC, the concert will be led by the KCC’s Branch County Community Chorus. The event will also include performances by the KCC Choral Union; the College’s Kellogg Singers; guest musical artist the Bel Canto Singers; a six-voiced vocal ensemble led by Gay Shaw; and student soloists. For more information about the above concerts or other musical events and initiatives at KCC, call 269-565-7859 or visit www.kellogg.edu/music. The Branch County Community Chorus is a 20-member mixed choir made up of community members and students who perform choral works from various periods and genres. For more information, visit www.kellogg.edu/branch. The Vocal Arts Area at KCC offers four choral opportunities including the Branch County Community Chorus, the Concentus Vocal Ensemble, the Choral Union Touring Choir and the Kellogg Singers, as well as an Opera Workshop, individualized voice lessons, master classes and student recitals. For more information, visit www.kellogg.edu/music.